Dead Space 2 released just a few weeks ago on the PS3, and if you're a PS3 owner and you picked up the Dead Space 2 Collector's Edition, you're probably aware you also now own Dead Space Extraction. If you're a PS3 owner and you didn't purchase the Dead Space 2 Collector's Edition, but you are interested in Dead Space Extraction, the good news is you can download the game from the PlayStation Store for just $14.99. Now, you may be wondering, "Is Dead Space Extraction really worth it?" or, "How many hours can I expect from it?" 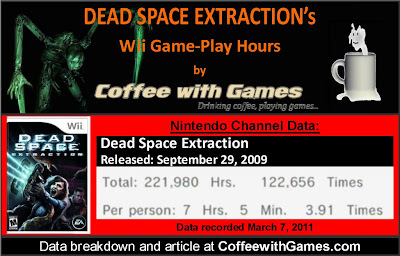 Well, being that Dead Space Extraction was originally released on the Nintendo Wii back in September of 2009, we can use the data reported through the Nintendo Channel to get a good idea of how many hours of game-play you can expect. How many hours have Wii owners spent blasting Necromorphs in Dead Space Extraction with 525 days of game-play reported, and how many hours can you expect if you're just picking it up? Let's take a look! Dead Space Extraction has approximately 31,369 Wii owners that have reported their game-play data through the Nintendo Channel. How many more players are reporting their play-time data since we last looked at Dead Space Extraction's play-time? Dead Space Extraction has seen an increase of about 13,866 more players reporting game-play data, since July 5, 2010. Dead Space Extraction has 221,980 Total Hours of game-play reported, an increase of 102,523 Total Hours in the last 246 days reported. Dead Space Extraction's average play-time is 7 Hours 5 Minutes "Per person" reporting data. The average play-time per session for Dead Space Extraction on the Wii is just over 1 Hour 48 Minutes. This means Wii owners average almost 2 hours each time they play Dead Space Extraction, but it appears once they complete the game, they don't really go back to it. Dead Space Extraction's "professional" review score average is 83.81%, based on 58 reviews on GameRankings.com. Dead Space Extraction has a 4 out of 5 Stars rating on Amazon.com, based on 57 customer reviews. Dead Space Extraction's customer review score average is 79.29%, when converted to a 100% review scale. As you can see, my reported time is a lot lower than the overall average. When Dead Space Extraction was released on the Wii, it released with a MSRP of $49.99. 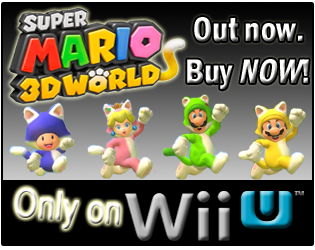 While Wii owners probably got the short end of the Necromorph deal with the original $50 price tag on the game, you can now find the Wii retail version for under $30 . I didn't really give Dead Space Extraction a chance, but both the Wii and PS3(so far) versions have been received pretty well by the gaming press, with the PS3 version of Dead Space Extraction having a "professional" review score average of 84.33%, based on 3 reviews on GameRankings.com. I think it's safe to say you can expect to get at least 7-10 hours of game-play from Dead Space Extraction on the PS3, especially with the challenge mode and the Trophies to obtain, based on the average reported by Wii owners. If you're a PS3 owner with the Sony Move bundle and you're looking for a new game to play with it, based on the game-play hours reported and the review score averages for the game, I don't think you can go wrong with purchasing Dead Space Extraction for under $20. If you have played, or have been playing, either version of Dead Space Extraction, is it a game you would recommend to other gamers? If you're a fan of the Dead Space story, do you feel Dead Space Extraction does a good job of staying within the universe set up in the original Dead Space, and perhaps even now in Dead Space 2? Interesting stats. I have Extraction for the Wii, and have logged a few hours. Unfortunately for it, I picked it up at the same time as 2 other games (Fire Emblem and Metroid: Other M) so it sort of took a back seat to those. From what I've played, I liked it. It doesn't feel like a Dead Space game in that it's a shooter on rails - that lack of exploration cuts down on the 'fright' factor a lot for me, but it's solid and I plan to finish it out eventually. I loved the first Dead Space and gave it a good review. I have Dead Space 2 sitting on my back log right now, so I'm hoping to play that and extraction through fairly soon. "...that lack of exploration cuts down on the 'fright' factor a lot for me..."
Have you played any of the Resident Evil on-rails Wii games by any chance, and know how they compare with the fright factor in Dead Space Extraction? Anywho, I hope your back log is getting sorted through, and I'm looking forward to seeing what's in store on your site as for upcoming reviews. Thanks for the comment, I appreciate it! I had a lot of fun with Resident Evil: Umbrella Chronicles in spite of the fact that I am not a big fan of on-rails shooters in my living room. I guess that means that I would probably enjoy Extraction as well... If you don't mind my prying, why is it that you only played it for 38 minutes? Was the gameplay good? Did something not rub you the right way? I sold DSE. It was like the Metal Gear Solid of light gun shooters. Way too much unskippable cutscene garbage to wade through. I want to play games, not watch them. I really enjoyed Dead Space Extraction since it kept the gameplay mechanics from its graphically beefy brother. The style may not be for everyone since it does spend a lot of time being cinematic, but if your a fan of the series I think you would like it. Plus it has a hoard type mode where you can just blast enemies nonstop if you get tired of the story. "If you don't mind my prying, why is it that you only played it for 38 minutes? Was the gameplay good? Did something not rub you the right way?" I believe my reason is what SuperPhillip commented beneath you...I couldn't skip the cut-scene, and was like, "Really, do I have to watch this?!" Perhaps if I gave it another go, I would enjoy it more, but I had just started school back, and was probably thinking like SuperPhillip, "I want to play games, not watch them", at the time. My comment above basically goes with your's, in that I didn't want to sit through cut-scenes, but wanted to play the game...a "Skip" button would have been nice, and gotten me into the game quicker, and perhaps I would have stayed playing it. Did the Wii version have the Hoard Mode? I know the PS3 version does, but as you can tell from my awesome 38 minutes of play-time, I didn't really check out much about the game. Thank you all for the comments/feedback! I appreciate it! @coffee Yes Wii version does. Did you play Dead Space 1 or 2. If not, your really doing yourself a disservice. I should probably add the first one to my list of future games to play...but I need to get busy with my New Year's resolution first! Nope, haven't played the RE rails games yet. It's a bit odd - I always dug the RE games, but the last one I played was 4 on my Gamecube. I keep planning to pick up the last few, just haven't yet. I rented Extraction (for Wii) as well, but I played it almost every day of the rental period (5 days). I didn't beat it, and I doubt I finished more than half of it. My Nintendo Channel data says I have 2 1/2 hours on my Wii, and my brother's Wii showed 4 1/3 hours (I moved my save file). He played some as well. I haven't played the other games, but I am interested if they have a similarly good presentation and story telling as Extraction. I would recommend it to those mature enough, if they're interested in a good sci-fi story and rail-shooter gameplay. I don't really think the "strategic dismemberment" adds that much in an on-rails format; they just feel like a standard weak-point system to me, in the end. I've heard the RE games are pretty good, THOUGH the shaky camera seems to be the biggest complaint about them. 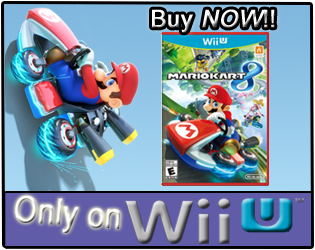 "I rented Extraction (for Wii) as well, but I played it almost every day of the rental period (5 days). I didn't beat it, and I doubt I finished more than half of it." Do you think you will ever go back and finish it in the future?